It's the 4th of July and I'm on a train from Manchester to York. I had originally planned to travel to York yesterday, but having not found a couch to surf I decided to stay in Manchester one more night. (Frankly, I have come to dislike packing all my things up and out every time I change cities.) But I enjoyed my time in Manchester - it was a much-needed break from my non stop stream of daily activities. Everyone was really nice and polite too, very British, which I liked (although I'm still working on developing my understanding of British sarcasm and humour). I did get a chance to watch a few comedy/panel shows last night, sort of like a wittier version of those VH1 gossip shows. Anyway, I rushedly said bye to each of the housemates either at night or in the morning, and I rushed to Piccadilly station to catch my train - but I missed it by just a minute. I kept calm and carried on to the next train, which left in 15 minutes, so no big deal. Did I mention how much I like trains? They're such a great way to travel, smooth and convenient. I remember being obsessed with trains when I was little; I wanted to be a train conductor. York is a well-preserved medieval city, founded by the Romans and with a lot of Viking history as well. It's great to walk around the city center. There's The Shambles, a narrow street with buildings that have remained the same since the middle ages apparently. 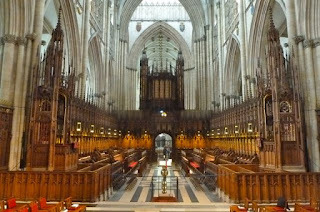 I arrived around 11am and walked from the train station to the York Minster, the cathedral that is York's landmark. Jacek, my host, met me there and we walked through the city center to his flat. 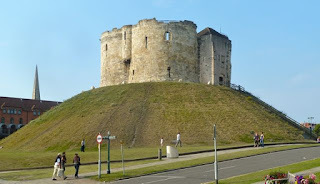 I then explored for a bit, seeing York Castle and going inside the museum. I didn't pay for a ticket - I just walked in and nobody stopped me! 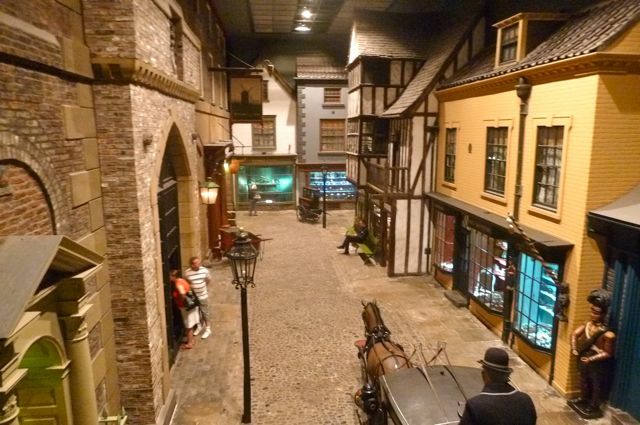 It was a random museum, with exhibits on domestic life from the middle ages to today, and then a portion of the York Castle prison, with an additional room displaying the cultural images of the '60s. (Random indeed!) 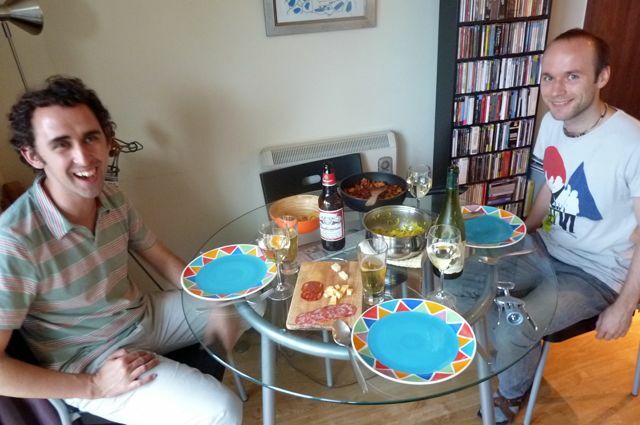 I stayed only for less than an hour, rushing back along the city walls, because Jacek had made lunch for me, and his boyfriend Marcelo came during his lunch break to join us. 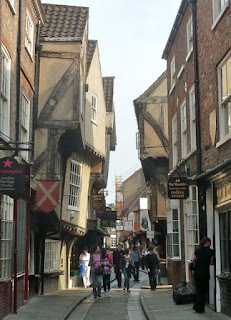 I then explored more of the city, crisscrossing the medeival streets and visiting the York Minster. Again, I was supposed to buy a ticket to enter but the woman at the entrance was occupied on the phone, so I just walked in without paying and nobody stopped me! The cathedral is spacious and impressive. Haunting organ music was playing as meek tour groups quietly strolled around inside. There was an astronomical clock, and the dungeons, which would have been cool to explore, were apparently closed. It was also the site where Constantine became the Emperor of Rome over 1700 years ago! Incredible. I then continued walking, over some of the city wall, until I ended up in a portion of York University, looking for a nice courtyard that Jacek had pointed out to me. It was nice, but not what I was looking for, so I walked around to the York Museum Gardens, which was what I was looking for. 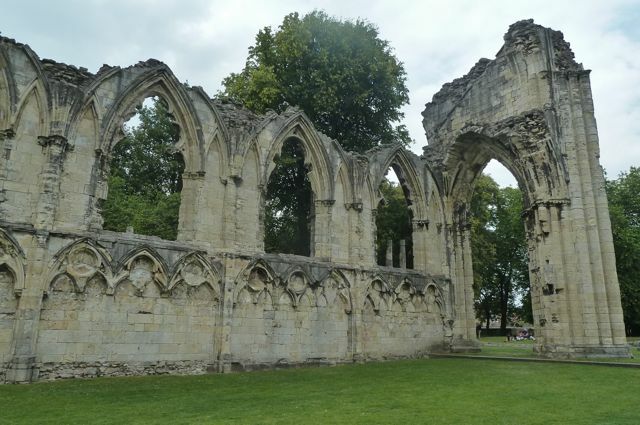 There were ruins around the park - some from the original Roman fort (Eboracum), and some of St. Mary's Abbey. It was all a big expanse of trees and flowers, which was a perfect place to sit and relax. I made my way back to Jacek's, taking a winding route through the city, stopping for a small pasty to snack on and for some Irn Bru to sugar up. 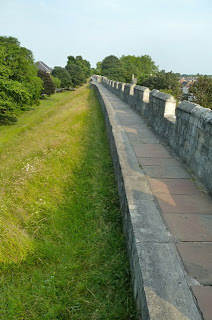 I walked along the city walls, which encircle the historic city core, and returned in time for dinner. Jacek and Marcelo are fans of opera and classical music, so we listened to various American composers as we ate our Latin-Indian-English-American dinner and as I imagined fireworks bursting in the distance. It was somewhat of a quiet 4th of July, but yet another enjoyable day on my journey.